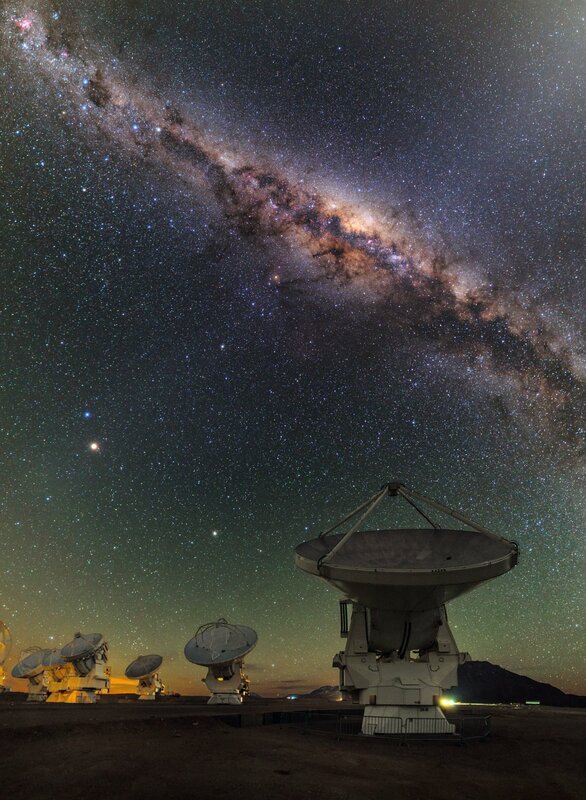 Scientists have carried out a major upgrade to the Atacama Large Millimeter/submillimeter Array (ALMA) by installing an ultra-precise atomic clock at ALMA’s Array Operations Site — home to ALMA’s supercomputing correlator. The current rubidium-based time reference has been replaced by a more accurate hydrogen maser. This upgrade will benefit all ALMA users and will eventually allow ALMA to synchronise with a worldwide network of radio astronomy facilities to form an Earth-sized telescope with the magnifying power required to see details at the edge of the supermassive black hole at the centre of the Milky Way . This corresponds to a resolving power thousands of times greater than achievable with the NASA/ESA Hubble Space Telescope. Before ALMA can lend its unmatched capabilities to this and similar scientific observations, however, it must first transform into a different kind of instrument known as a phased array. This new version of ALMA will allow 50 of its 66 antennas to function as a single radio dish with the collecting power of a dish 85 metres in diameter. 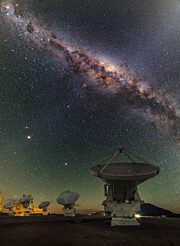 The ALMA Phasing Project is an ALMA upgrade project led by Shep Doeleman of the MIT Haystack Observatory in the USA, with significant participation from institutes in Europe and East Asia. A major milestone along this path was achieved recently when the science team performed what could be considered a “heart transplant” on the telescope by installing a custom-built atomic clock powered by a hydrogen maser . This new timepiece uses a process similar to a laser to amplify a single pure tone, cycles of which are counted to produce a highly accurate “tick”. There are many future applications for the ALMA phased array, including its use as one element of global networks of telescopes such as the Global mm-VLBI Array and the Event Horizon Telescope (EHT). The EHT will be able to image the environment close to the event horizon  around the supermassive black hole at the centre of the Milky Way . These global arrays derive their extreme magnifying power from connecting widely spaced radio dishes across the globe into an Earth-sized virtual telescope. This technique, called interferometry, is the same process that ALMA itself uses to combine the signals from its many antennas in normal operation. It also enables optical/infrared telescopes like ESO’s Very Large Telescope array (VLT) to achieve ultra-high resolution by combining several telescopes to work as one giant telescope, the ESO Very Large Telescope Interferometer. The difference between existing radio interferometers and the future world-wide interferometer is the sheer geographical scope of the new project, its extension to the shortest observing wavelengths, and the addition of the unprecedented collecting area enabled by a phased ALMA. The Max Planck Institute for Radio Astronomy in Bonn, Germany, is providing crucial software for the ALMA Phasing Project. 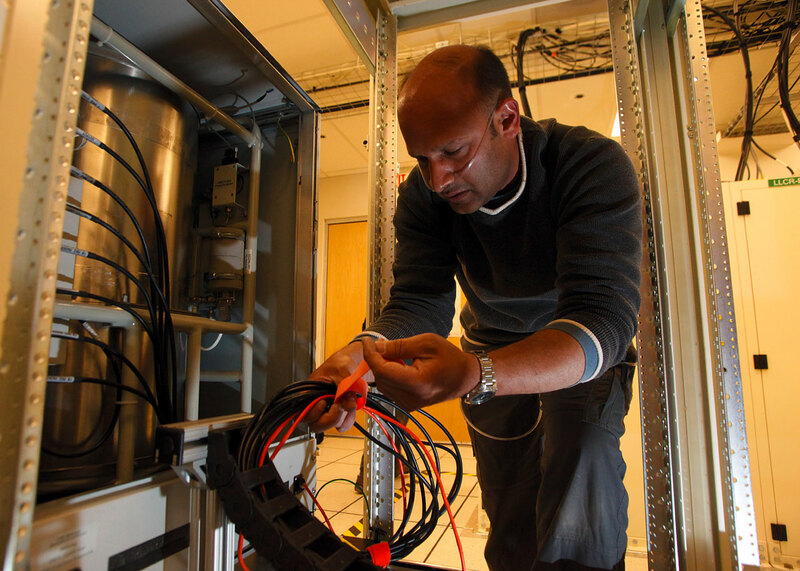 Its Director, Anton Zensus, adds: "The ALMA Phasing Project is a vital step towards the goal of a global millimetre array for the international user community, building on years of effort in the US and Europe. Such an array has enormous potential in many scientific areas, including jet formation in active galaxies as well as imaging of black hole event horizons." The event horizon is the surface around a black hole where events inside cannot affect an outside observer. It can be thought of as the “point of no return” for an infalling astronaut. The black hole at the centre of the Milky Way is a four million solar mass giant located approximately 26 000 light-years from Earth in the direction of the constellation Sagittarius. It is shrouded from optical telescopes by dense clouds of dust and gas, which is why observatories like ALMA, which operate at the longer millimetre and submillimetre wavelengths, are essential to study its properties. Maser is derived from the acronym MASER, meaning “Microwave Amplification by Stimulated Emission of Radiation”. In the same way that light is used in a laser, making use of optical amplification, a maser instead works in the microwave part of the spectrum.